U.S. doctors are prescribing enough antibiotics to give them to 4 out of 5 Americans every year, an alarming pace that suggests they are being overused, a new government study finds. Overuse is one reason antibiotics are losing their punch, making infections harder to treat. The report released Wednesday gives the first detailed look at usage of these medicines in every state and finds it highest in the South and Appalachia. "It sounds high," said Keith Rodvold, a professor of pharmacy practice at the University of Illinois at Chicago. There is no scientific consensus on an appropriate level of antibiotic prescribing. But some experts said the new study's results are disturbing, and that rates are probably excessive even in the states with the lowest antibiotic prescription levels. Antibiotics have been commonly available since the 1940s, and have done wonders at saving patients with infections ranging from pneumonia to sexually spread diseases. But bacteria have increasingly gained the power to shrug off antibiotics. Experts say chances of resistance increase when antibiotics are not used long enough or are taken for the wrong reasons, allowing bacteria to survive and adapt. The Centers for Disease control and Prevention is tracking at least 20 strains of resistant bacteria. 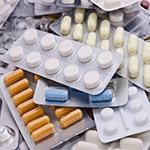 CDC researchers conducted the new study, analyzing a national prescription drug database for 2010. The findings are being published in Thursday's New England Journal of Medicine. Other studies have focused on antibiotic prescriptions for specific groups like Medicare patients. This is the first to look at it for all Americans. Doctors and other health care providers prescribed 258 million courses of antibiotics in 2010, for a population just shy of 309 million, the researchers found. That translates to 833 antibiotic prescriptions for every 1,000 people, on average. But rates were much higher in West Virginia, Kentucky and Tennessee, where about 1,200 were written for every 1,000 people. On the low end were Alaska, Oregon and California, where prescriptions were at or below 600. Earlier studies found similar geographic trends. One possibility: Southerners suffer more infections than people in other parts of the country. Southern states have the highest rates of obesity and diabetes, and diabetics tend to have more infections than other people, noted the CDC's Dr. Lauri Hicks, one of the study's authors. "So some of that prescribing may be warranted," she said. During the swine flu pandemic of 2009 and 2010, the South saw more reports of illness than other parts of the country. Experts at the time said patients with flu-related pneumonia should be treated with both antiviral medicines and antibiotics to prevent all forms of deadly complications, Rodvold noted. The South also has higher rates of certain other respiratory infections, including bronchitis, according to a study last year by University of Pittsburgh researchers. And the CDC study found the most frequently prescribed antibiotic was azithromycin, which is commonly used for bronchitis symptoms. But that's a problem. Bronchitis is usually caused by a virus, and antibiotics like azithromycin don't work against viruses. "Some of the prescribing may not be warranted," Hicks said.